Feel free to explore a gallery of chocolate decadence. 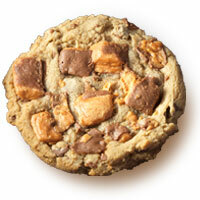 All our creations are available through our online store or baked fresh at our South Jordan, UT location. See what makes our creations truly Over the Top! 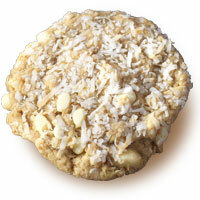 White Chocolate Chips, Macadamia Nuts, Pineapple Chunks & Toasted Coconut Over The Top! Ingredients: Enriched wheat flour (wheat flour, niacin, iron, thiamine, riboflavin, folic acid), brown sugar, white chocolate chips (sugar, partially hydrogenated palm kernel, palm, soybean and/or cottonseed oils, whole milk powder, whey, cream powder, nonfat milk powder, lactose, cocoa butter, milk fat, soy lecithin, vanilla), butter, sweetened dried pineapple (dried pineapple, sugar, citric acid, sulphur dioxide added as a preservative), eggs, macadamia nuts, sweetened flaked coconut (coconut, sugar, water, propylene glycol, salt, sodium metabisulfate), vanilla, baking soda, salt. Contains: Wheat, milk, eggs and soybeans. Prepared in a facility that processes peanuts and tree nuts (pecans, walnuts, macadamias). 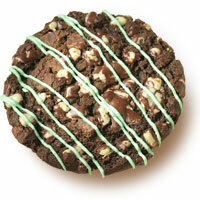 Double Chocolate Cookies with Andres Mints & Mint-Flavored White Chocolate Drizzled Over The Top! 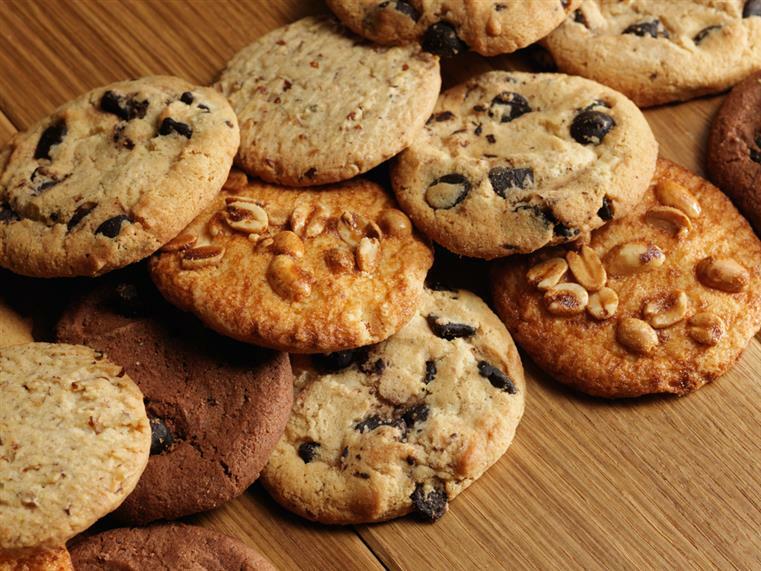 Ingredients: Enriched wheat flour (wheat flour, niacin, iron, thiamine, riboflavin, folic acid), sugar, brown sugar, semi-sweet chocolate (sugar, chocolate liquor, cocoa butter, soya lecithin, vanilla extract, vanillin, milk solids) and butter, Andes® Baking Chips (sugar, partially hydrogenated vegetable oils (palm kernel and palm), cocoa (processed with alkali) nonfat milk, lactose, milk protein concentrate, soy lecithin (an emulsifier), natural and artificial flavors, peppermint oil, colors added (yellow 5 lake, blue 1 lake) eggs, white chocolate icing (sugar, partially hydrogenated palm kernel oil, whey powder, soya lecithin, artificial flavors, milk), cocoa, vanilla, baking soda. 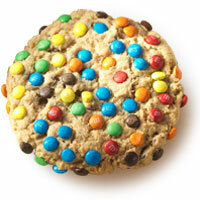 Milk Chocolate Chip Cookies with Colorful M&M Candies Sprinkled Over The Top! Ingredients: Enriched wheat flour (wheat flour, niacin, iron, thiamine, riboflavin, folic acid), brown sugar, milk chocolate chips (sugar, cocoa butter, whole milk powder, chocolate liquor, soya lecithin, vanillin) and butter, M&M® Milk Chocolate candies (milk chocolate (sugar, chocolate, cocoa butter, skim milk, milkfat, lactose, soy lecithin, salt, artificial flavor), sugar, less than 2% of the following: cornstarch, corn syrup, coloring (includes yellow 5 lake, red 40 lake, blue 1 lake, yellow 6 lake, blue 2 lake, blue 1, blue 2, red 40, yellow 5, yellow 6), dextrin), eggs, vanilla, baking soda, salt. 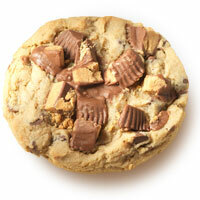 Milk Chocolate Chip Cookies with Chunks of Reese's Peanut Butter Cups Melted Over The Top! Ingredients: Enriched wheat flour (wheat flour, niacin, iron, thiamine, riboflavin, folic acid), brown sugar, milk chocolate chips (sugar, cocoa butter, whole milk powder, chocolate liquor, soya lecithin, vanillin) and butter, Reese’s® Milk Chocolate peanut butter cups (milk chocolate (cocoa butter, chocolate, nonfat milk, milk fat, lactose, soya lecithin and PGPR (emulsifiers), peanuts, sugar, dextrose, salt, TBHQ and citric acid (preservatives), eggs, vanilla, baking soda, salt. 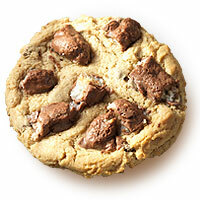 Milk Chocolate Chip Cookies with Chucks of Almond Joy Candy Bars Melted Over The Top! Ingredients: Enriched wheat flour (wheat flour, niacin, riboflavin, folic acid), brown sugar, milk chocolate chips (sugar, cocoa butter, whole milk powder, chocolate liquor, soya lecithin, vanillin) and butter, almond joys® Milk chocolate bars (corn syrup, milk chocolate (sugar, cocoa butter, chocolate, milk, lactose, milkfat, nonfat milk, soy lecithin & PGPR (emulsifiers), coconut, sugar, almonds, partially hydrogenated vegetable oil (cottonseed and soybean oil), whey (milk), salt, cocoa, natural and artificial flavor, chocolate, egg whites, soy lecithin, sodium metabisulfate and sulfur dioxide), eggs, vanilla, baking soda, salt. 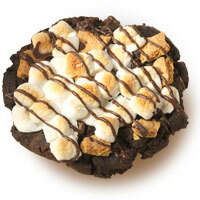 Double Chocolate Cookie with Grahams, Toasted Marshmallows & Rich Chocolate Melted Over The Top! Ingredients: Enriched wheat flour (wheat flour, niacin, iron, thiamine, riboflavin, folic acid), sugar, brown sugar, semi-sweet chocolate (sugar, chocolate liquor, cocoa butter, soya lecithin, vanilla extract, vanillin, milk solids), butter, eggs, cocoa, vanilla and baking soda, marshmallows (corn syrup, sugar, modified food starch (corn), dextrose, water, gelatin, natural and artificial flavor, tetrasodium pyrophosphate, blue 1), graham crackers (enriched wheat flour, sugar, graham flour, partially hydrogenated vegetable oil shortening (contains one or more of the following: soybean oil, cottonseed oil), high fructose corn syrup, honey, sodium bicarbonate, salt natural and artificial flavor, soy lecithin (an emulsifier)), chocolate icing (sugar, partially hydrogenated palm kernel oil, cocoa, soya lecithin, artificial flavor, milk). 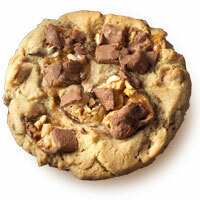 Milk Chocolate Chip Cookies with Chunks of Snickers Bar Melted Over The Top! Ingredients: Enriched wheat flour (wheat flour, niacin, iron, thiamine, riboflavin, folic acid), brown sugar, milk chocolate chips (sugar, cocoa butter, whole milk powder, chocolate liquor, soya lecithin, vanillin) and butter, snickers® bars (milk chocolate (sugar, cocoa butter, chocolate, lactose, skim milk, milkfat, soy lecithin, artificial flavor), peanuts, corn syrup, sugar, skim milk, butter, milkfat, partially hydrogenated soybean oil, lactose, salt, egg whites, artificial flavor), eggs, vanilla, baking soda, salt. 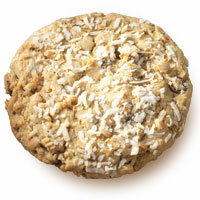 Milk Chocolate Chips, Pecans, Toffee Bits & Toasted Coconut Sprinkled Over The Top! Ingredients: Enriched wheat flour (wheat flour, niacin, iron, thiamine, riboflavin, folic acid), brown sugar, milk chocolate chips (sugar, cocoa butter, whole milk powder, chocolate liquor, soya lecithin, vanillin), butter, toffee bits (sugar, butter, almonds; contains 2% or less of : milk chocolate (sugar, cocoa butter, chocolate, nonfat milk, milk fat, lactose, soya lecithin, salt, vanillan), milk, salt), pecans, eggs, sweetened flaked coconut (coconut, sugar, water, propylene glycol, salt, sodium metabisulfate), vanilla, baking soda, salt. 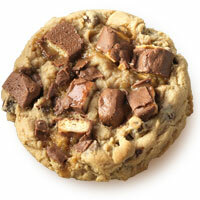 Milk Chocolate Chip Cookies with Chunks of Milk Way Candy Bars Melted Over The Top! 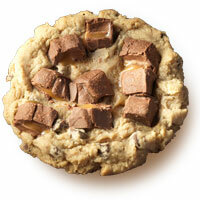 Milk Chocolate Chip Cookies with Chunks of Twix Candy bar Melted Over The Top! 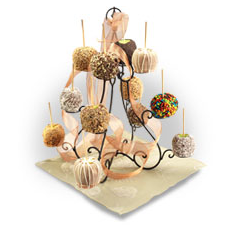 A pleasant indulgence of apples dipped in a mixture of caramel, nuts, chocolate and candies. 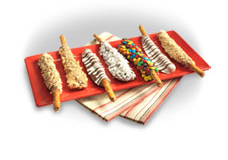 Large pretzel sticks dipped in caramel, tehn milk chocolate, then coated in a dizzying array of other decadent goodness.